EM-Tec versatile SEM stage adapters for FEI, Philips, Zeiss, Leo, JEOL, Hitachi, Tescan, Pemtron SEMs, FESEM and table top SEMs. 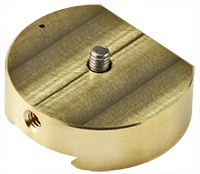 EM-Tec PV64 SEM stage adapter with M4 threaded top, brass. Compatible with Pemtron SEMs PS-230 and PS-250. The EM-Tec versatile SEM stage adapter for Zeiss/LEO SEMs, FESEMs, CrossBeams and SE/FIB systems consists of the Zeiss/LEO compatible universal dovetail with an M4 screw. 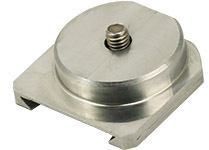 This stage adapter is compatible with all EM-Tec SEM sample holders with M4 threaded hole. The EM-Tec JV40 versatile SEM stage adapter kit is based on the JEOL Neoscope disc type stage adapter. It has a height adjustment pillar with an M4 screw on top. This EM-Tec versatile stage adapter will give JEOL NeoScope users access to the large selection of the EM-Tec SEM sample holders with an M4 threaded hole. 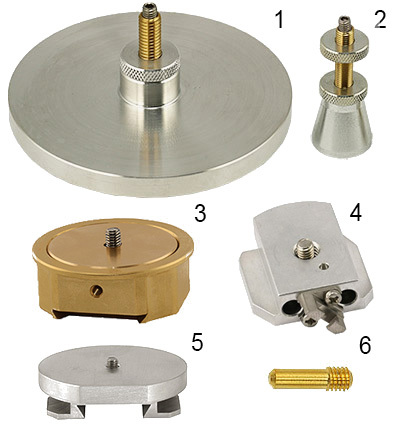 This adapter kit is fully compatible with the benchtop SEMs JEOL NeoScope JCM6000 and JCM5000. 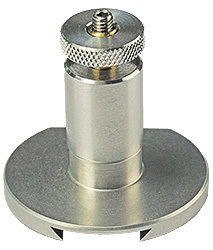 The EM-Tec JV-40 versatile SEM stage adapters for NeoScope benchtop SEMs include the stage adapter, two height adjustment pillars (18 and 25mm) with M4 screw and a height gauge to set the sample height. 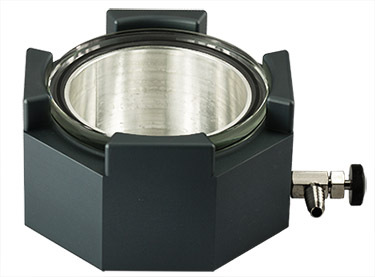 Simply replace the original JELO Neoscope stage adapter with the EM-Tec JV40 Neoscope stage adapter and use any of the EM-Tec sample holders which will fit in the chamber of the Neoscope. 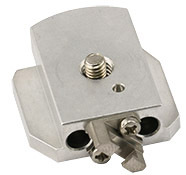 The Hitachi HV48, HV40, HV50, HV34 are supplied with an M4 screw which fits through the M6 threaded hole. The Hitachi stub extensions with standard M6 thread all fit in the EM-Tec stage adapters with an M6 threaded hole. 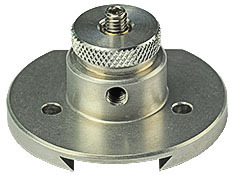 The EM-Tec PV64 stage adapter for the Pemtron SEMs comprises the Pemtron 6mm pin with flat and an M4 threaded top. 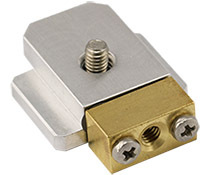 With this versatile EM-Tec stage adapter, the large selection of EM-Tec sample holders with M4 threaded hole can be used on the Pemtron SEM. Made from brass. 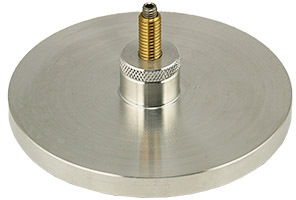 The EM-Tec SH4 stage adapter for the Hirox SH-4000 table top SEMs consists of an M4 theaded stainless steel rod with two brass locking nuts. One end of the M4 threade rod screws into the Hirox SH-4000 stage; this also enables heigth adjustment. The other end of the M4 threaded rod adapts to the large selection of the EM-Tec sample holders with M4 threaded hole. 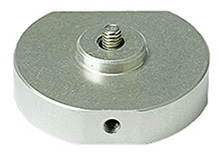 It also enables the use of standard Hitachi stubs with M4 threaded hole on the Hirox SH-4000. The two locking nuts are used to tighten the adapter to the stage and the sample holders/stubs. Standard pin stub to M4 adapter, compatible with Compatible with FEI, Philips, Tescan, CamScan, Cambridge Instrument, Leica, Phenom, Aspex, ETEC and Novascan SEMs. Ordering information for the EM-Tec versatile SEM stage adapters for FEI / Philips SEMs and DualBeam systems. Include M4 screw op top. 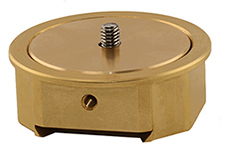 11-000606 EM-Tec PV64 SEM stage adapter M4 threaded top, brass. Compatible with Pemtron SMs PS-230 and PS-250.